The Cell Symposium Single Cells: Technology to Biology will be held at the A* STAR Genome Institute of Singapore, a unique place for scientific discovery. Singapore has a fully integrated and efficient public transport network that encompasses buses, MRT trains and taxis. These services offer convenience, comfort and value for money. They are also the most popular modes of transport for locals and visitors. You can take the following bus services and alight along North Buona Vista Road. The services are Singapore Bus Service (SBS) numbers 91, 92, 95, 74, 191, 196, 198, 200. Board the East-West line heading towards Boon Lay and alight at Buona Vista MRT Station. Taxi stands are located outside the Arrival Hall on Level 1 in Terminal 1 and at Terminal 2, you can find them at the end of the Arrival Hall (South Wing) on Level 1. The journey to Biopolis is about 40 minutes and the fare will cost about S$40*. If you board a cab during the morning and evening peak hours, do note that there will be other surcharges as well. For more information, please consult the taxi driver. *A surcharge of S$3.00-S$5.00 is payable for all trips originating from the Changi Airport. Board the East-West Line from the Changi Airport MRT station at Terminal 2 basement 1 and alight at Buona Vista MRT station. 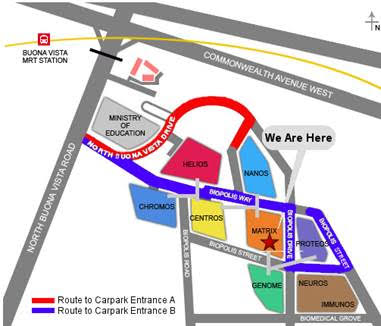 You can then transfer to a shuttle bus service that will take you directly to the Biopolis. The shuttle service is provided free of charge.